In the night between the 28th and 29th of January 2015, Destroika struck in Berlin, and two prison industry vehicles turned into ruins. Through these pinpricks, we will limit the flexibility of the relevant companies. 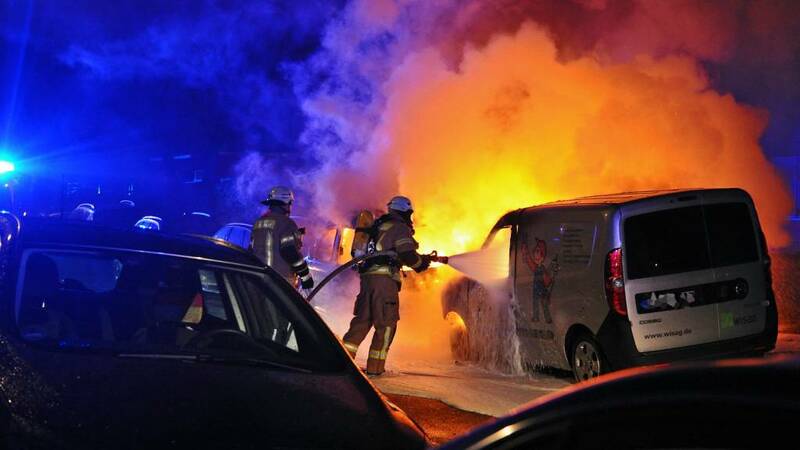 A van of Wisag in Lichtenberg and another of Sodexo in Moabit came under attack. The company WISAG provides, in addition to the exploitative cleaning sector, security staff for transport services such as the BVG transport company in Berlin, and is responsible for filling the Berlin prisons of fare-dodgers, with ticket inspectors plain-clothed as well as in uniform. Freedom for the prisoners of Operation Pandora and all the others! On the 18th of March 2015 off to Frankfurt – to reduce the European Central Bank to ruins and ashes! Translation note: On January 30th, the remaining seven prisoners of Operation Pandora were released on conditional bail. 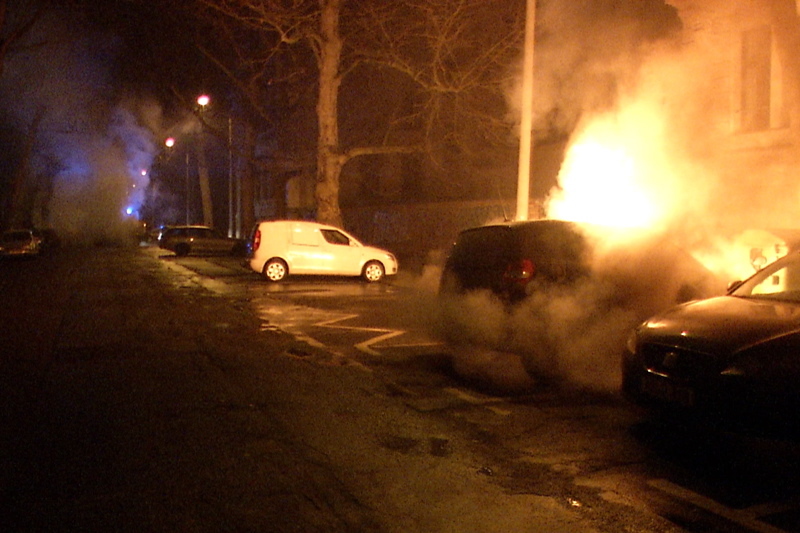 In the night of 20th-21st January 2015, we attacked during a targeted action the whole fleet of vehicles of the multi-million euro real estate speculators GRK Holding in the southern-centre of Leipzig, and with this we delivered flames to four vehicles. The real estate company referenced is one of the largest long-term profiteers of gentrification in Leipzig. Spread throughout the city, the big company projects are either under construction or have already been completed. The systematic terror against the tenants is still high on the agenda, such as gentrification ensuing the cheaply purchased property renders Leipzig more attractive for people with a higher monthly income. de solicitud de extradición del revolucionario alemán Bernhard Heidbreder. Through this I inform you that on Tuesday 16 December 2014 at 2pm the Criminal Chamber of the Supreme Court agreed to a public hearing in the case request for the extradition of the German revolutionary Bernhard Heidbreder. Agradecemos de antemano toda la solidaridad que puedan brindar. laboratory and was prosecuted and sentenced as a terrorist. tells a bit more about the US prison system and his experiences with it. The length of the interview is: 11:20 min. The length of the presentation is: 59:10 min. In the night of November 21st, 2014, the Office of probation services and juvenile court assistance located in the Museumstrasse in Altona, Hamburg, was attacked with stones, and many windows were broken. Against the State, its Justice and minions! Solidarity with the accused and the imprisoned in the case of squatting in the Breite Strasse in Hamburg! Solidarity with the squatters, who really showed the cops! Rage and struggle for Rémi Fraisse, who was killed in France some weeks ago after he was hit by a grenade during clashes with the cops! Freedom is not negotiated or begged for! We would like to present an interview with Nicky Danesh, an Iranian anarchist living in exile in Australia, made by Furia de Radio from September. Furia de Radio is an anarchist programme on 97 Irratia FM in Bilbao. It can be heard every Friday at 7pm in the Basque Country, or on mixcloud.com/FuriaDeRadio. As Anarchist Radio Berlin we have edited the English version of the interview from the original programme into a single segment and re-recorded the questions to help with its distribution. The length is: 12:40 min. ps. : Please note: We are always looking for people willing to lend us a hand with transcript translations from Spanish or German into English as well as people able to do voice recordings – in order to amplify our international radio work. You can contact us at aradio-berlin/at/riseup(dot)net! Many of us are spontaneously and long since aware of it: prisons are places of ethical, humane, moral and cultural decay. There is no desire for life, freedom, humaneness conveyed there but instead the guards and any other staff treat the detainees as dead objects; they manage people as piece goods in a storehouse. So prisons are necrophiliac places. A short update from comrade Thomas Meyer-Falk about the inhuman conditions in German prisons. Thomas was locked up for 11 and a half years in 1996 for a politically motivated bank-robbery and has spent most of his sentence in isolation. He had his sentence extended and remains incarcerated today. On 18th August 2014 Koala Rosmane died after two years in Bruchsal Prison, Germany. A few days later the prison director, Mr M, was suspended. In 2012 Koala Rosmane was convicted of manslaughter and sentenced to ten years in jail. Maybe because he had trouble with a prison officer, and/or maybe because Rosmane came from Burkina Faso in Africa, he was sentenced to another year and kept in solitary confinement for the past two years. It has been said that racist officers insulted the inmate often. For the past few months he refused prison food, maybe because he feared that the prison administration wanted to poison him. The forensic doctor who carried out the post mortem examination said that the prisoner was extremely malnourished. Maybe he died of starvation. Translated from linksunten.indymedia.org by anarchist comrade Marco Camenisch. Translated from Italian by act for freedom now. In the night between 26th and 27th July 2014 we tossed molotov bottles at several ‘Bayer AG’ vehicles – and with this action we started off our Tendency of Eco Struggle. During the first world war ‘Friedr. Bayer & Co’ (which later became ‘Bayer AG’) produced explosives and chemicals for war purposes. Their troubles in getting supplies were not due to humanitarian scruples but to security risks and lack of labour force. As soon as the war turned into trench warfare gas begun to be strategically used as a weapon, and Bayer begun to supply the army with tens of thousands of tons of various types of gas. Not content with their turnover, ‘Friedr. Bayer & Co’ also formed alliances with other chemical companies in a ‘community of interest’ following the example of the American Trusts of the time. The economic crisis that followed the war didn’t last long, and in 1925 nine chemical companies led by ‘BASF’ formed ‘JG Farben’. At the beginning (1926), ‘JG Farben’ didn’t embrace the aspirations of the national-socialist party, but then they realized that their production of synthetic petrol couldn’t function without funding. Back in 1932, a year before the electoral victory of NSDAP (German National-Socialist Workers’ Party), the company made contact with Hitler and obtained his support. In order to guarantee stability in their profits, ‘JG Farben’ thought it useful to contribute to the electoral expenses of the NSDAP with about 400,000 Reichsmark (German marks). Since then their cooperation with the Nazi regime flourished almost without frictions. Almost the entire board of directors of the company became members of the NSDAP, while monopolization made ‘JG Farben’ the fourth most important company in the world. During the Spanish Civil war, the company provided financial support to Franco’s troops, while in Guernica the Luftwaffe had the chance to test an incendiary bomb produced by ‘JG Farben’ on civilians. During the second world war ‘JG Farben’ was committed to the production of war weaponry and was one of the responsible for the murder and exploitation of prisoners in concentration camps. Turkey will decide at the present day on the extension of the ‘anti-terrorist’ struggle. This will mainly affect Kurdish people in Syria, which they as well as the PKK (Kurdish Peoples Party) stand on the Turkish terror list. Turkey’s fear of the Kurdish people is greater than of the ISIS-fighters. For example, Turkey supports the ISIS-fighters to their best of their will, for example, at border crossings to Syria or arms shipments that were observed by Kurdish people, or the medical care of injured ISIS-fighters in Turkish territory. On the Turkish side of the border, the Turkish army is using force of arms against all those Kurdish people trying to come to Kobane to oppose the corruption. Clashes occur daily there between Turkish security forces and Kurdish people who come from all over Turkey to help the trapped fighters of YPG in Kobane. Tonight we have attacked the Turkish State in the NATO hinterland to brand it as an inhuman actor in this conflict. Two vehicles of the Turkish State – representatives of the Embassy are burned … At the same time, we appeal to everyone, not to stand idly by, ignite the solidarity for our brothers and sisters. We tremble with the combatants, but their determination is our courage. We will not abandon the ideals and freedom. Maximum global solidarity! In Memory of Berivan Sason, fallen but never dead! NB: Ceylan Ozalp (Code Name: Berivan Sason) was an active fighter and leader with several comrades in the northern Syrian Kurdish city Kobanê in armed resistance against the ISIS/Daesh. Secret animal testing lab revealed! They are conducting tests on beagles. The laboratory is located at the spot where the infamous animal testing company HARLAN operated a lab. HARLAN left Walsrode at the end of 2009. BIOMEDVET has been there since the beginning of 2010. The animal murder continued, only with other perpetrators. The laboratory is small but for the animals who are dying it does not matter. Murder is murder. The laboratory is totally secluded in a wooded area. It is well hidden and hardly anyone knows about it. The company has no website. They probably thought they would go undetected. Even in the animal rights scene, the lab may be unknown. Unfortunately it was not possible to liberate the dogs. But we attacked an expensive car on the premises: Paint stripped and glass etched. Companies like BIOMEDVET must be pulled from anonymity. Our motto: Animal killers, you can not hide! We will find you sooner or later! Our message to the animal rights scene: Make something out of this! The underground has done its part. Animal testing is murder. We will resist animal testing and all forms of animal exploitation. No rest for the animal murderers! The interview was conducted by Rüdiger Göbel, Peter Rau, Wera Tichter, and Gerd Schumann of jungle Welt, left newspaper in Germany, 2007. Long live the combative memory of Helmut Pohl and Rolf Clemens Wagner of the RAF. Never forget, never forgive. junge Welt: The media has squeezed everything possible out of the 2007 anniversary of the “German Autumn.” The events of 1977 came to a bitter end. The way it is being depicted on TV, on the radio, and in the print media constitutes a sort of hysterical coming to terms with the Red Army Faction (RAF): The Stammheim Night (Spiegel), a series; The Terror Years (Die Zeit), a special issue; The Bourgeois Children’s War, a primetime ARD documentary. How do you feel about the way in which the RAF’s history is being handled, given that this history is an important, if not the essential, component of your personal biographies? Helmut Pohl: It’s unpleasant. To be smashed over the head with this sort of campaign of defamation, caricature, and debasement is somewhat infuriating. It has concrete consequences for Christian, as well. Beyond that, it seems to me that the principal component of the campaign, the two-part Aust documentary on ARD, bombed. It’s already been done to death. People don’t want to hear about it anymore. jW: You’re talking about the fuss surrounding Christian Klar during the first three months of 2007. In the case of a prisoner who has been behind bars for 24 years, relaxed conditions with the possibility of a pardon and release seems appropriate. His admittedly partisan, but essentially analytical contribution to the junge Welt Rosa Luxemburg Conference in January, which in no way encouraged violence, unleashed an anti-RAF and anti-Klar onslaught from politicians and the bourgeois media. What this made clear was that a prisoner’s right to express himself does not apply to Klar. In fact, it was turned into an exceptional case for the German justice system.